Pending the arrival of baby Kaidan James , the soon to be parents contacted Arkade Graphics to assist with a spot of re-decorating . The theme given was old Pooh bear and friends, and after trawling through images and making some adjustments an appropriate selection was made. Painted in 3 hours with the help of Ethic the overall result was just what was expected . 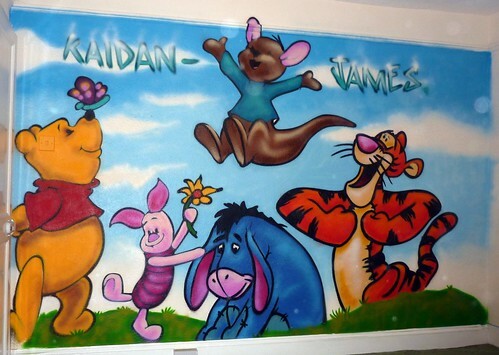 This entry was posted in Commissions and tagged disney graffiti bedroom mural, Disney mural, kids disney bedroom painting. Bookmark the permalink. Wow great thanks a lot for sharing it it is fandabbiedozzie. Never seen anything like it. What a lucky boy. His daddy is tooooooo.